Hi everyone! As soon as I saw the current Make It Monday over at Papertrey Ink, I knew I had to create! This is a craft project that is right up my alley- cute, cute, cute! 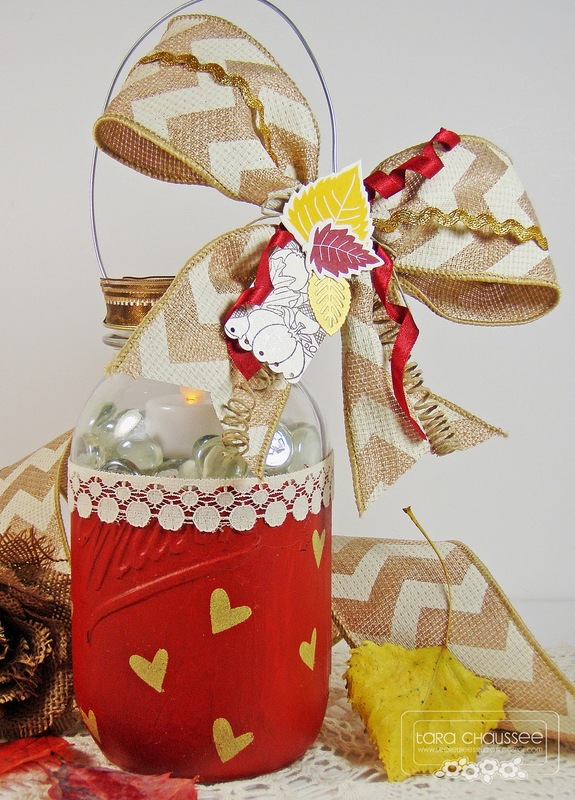 Mason jars are great for so many things besides canning and this project puts them to good use. I took the opportunity to turn some stashed away jars into candleholders that will be on display in my dining room for Thanksgiving! Of course, I couldn't stop at one and I would probably still be happily crafting if this contest didn't have a deadline! 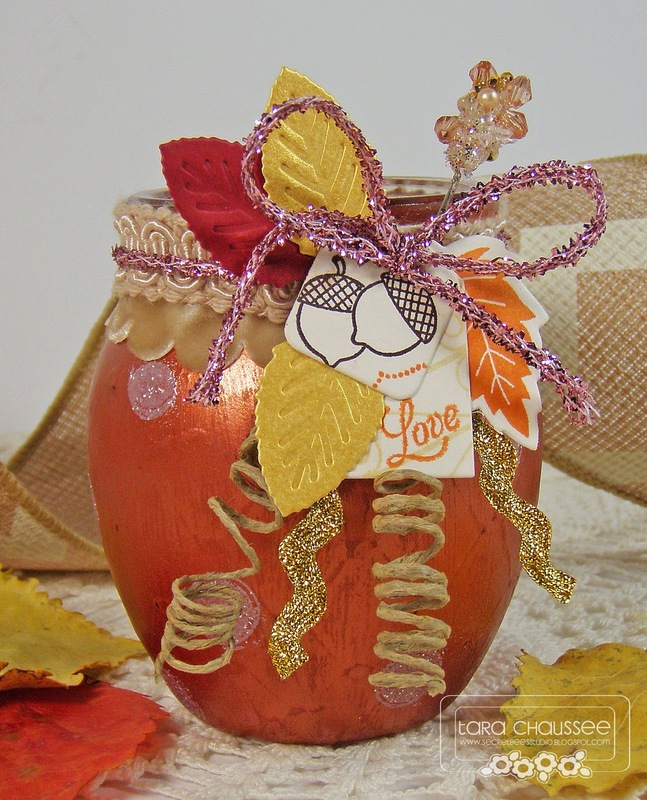 The first jar was painted with buttercream acrylic paint and then heat embossed fall leaves in copper and gold. I added in a big embellished 'junk' bow and a Tremendous Tag with a very sweet sentiment! I added a bit of burlap ribbon around the lid rim, filled it with stones and put in a flickering candle. Since I had already put large detail right on the first jar, I created a big bow for the second that would attach to the handle. This one was painted in a mixture of napthol red and burnt sienna for a rich Fall color. I added in embossed gold hearts and a bit of lace trim around the top. Lots of embellishments in this bow too. Leaves and rick rack and ribbon along with another Tremendous Tag- this one stamped with an Autumn image. It too is filled with stones and a flickering candle! Last but definitely not least is the baby jar of the group! This one is painted in a gorgeous iridescent copper and embossed in mini polka dots of white pearl. There is an interesting diamond pattern on this jar that shows up quite nicely too! 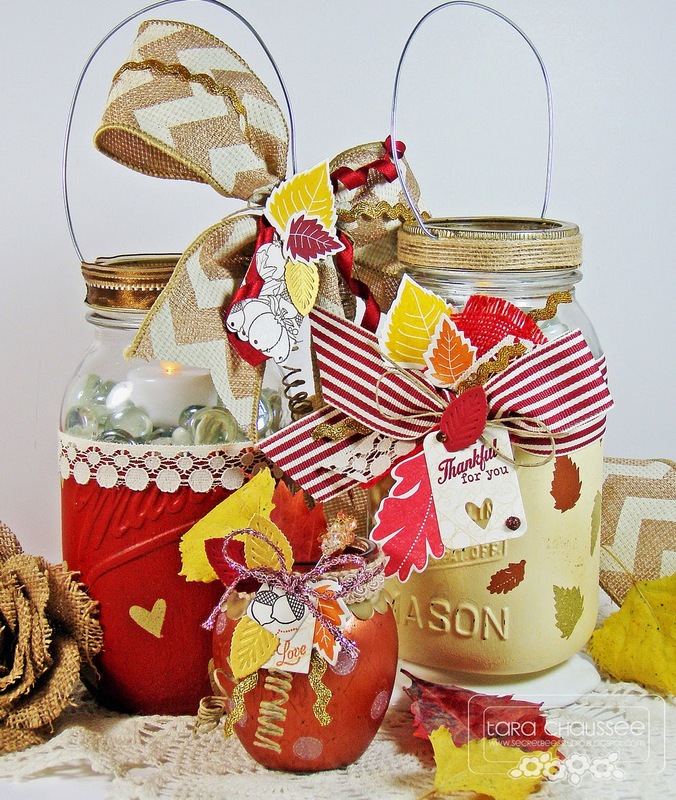 A smaller embellished tag full of more Fall leaves and sparkly ribbon is wrapped and attached to the top of the jar. These will be beautiful at Thanksgiving dinner and until then, I will enjoy their beauty! ADORABLE! I am in love and in awe. Perfectly sweet it every way! Thanks for playing along :). lovely decorated glasses, they look georgous! Oh my! These jars are fabulous! You really went above and beyond! These will look lovely on your table. I really like the idea of putting a candle in them. Love all your ribbon and embellishments too! OMG these are absolutely fantastic! !Such beautiful colors and gorgeous ideas. LOVe all of them! Tara, these are just beautiful! They truly look store-bought, except better, because you've coordinated them so perfectly. Decorated to perfection! Oh these are so sweet….I adore the colour, embossing and your junk bow is soooo perfect! Wow,Tara thes are wonderful! You went all out and made such fun decorations to go with. I love them all but that last one is sooooo gorgeous with the shape and color..just like a pumpkin,and it's decorated perfectly! Congrats on your much deserved FB shout out ! Can you tell I love these jars! These are fabulous! I too am in love with the last jar. The shape and pattern on the jar makes it so fun and it truly does make me think of a sweet little pumpkin jar. Well done! Oh my goodness!! Each one of these is stunning Tara! Thanks for all the wonderful inspiration! Love, love, love these!!!!!! 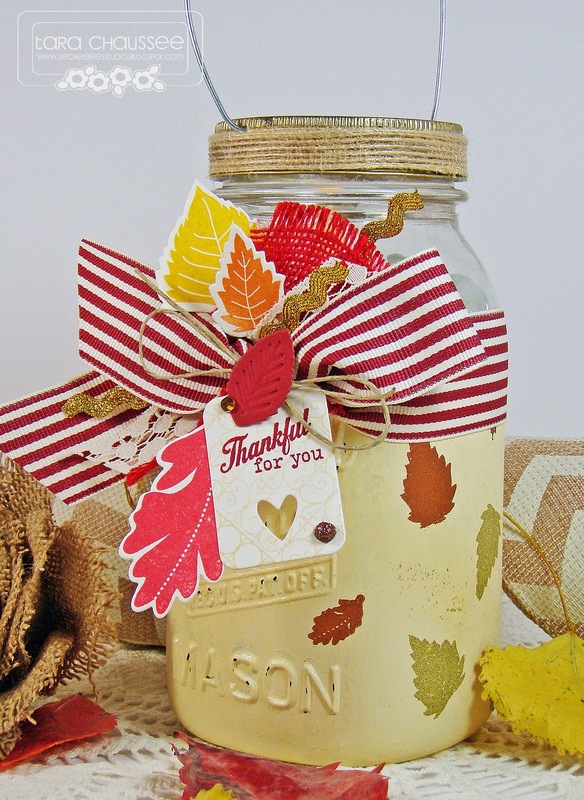 I love anything with a mason jar, and the Fall colors are gorgeous! What a great project! OH I LOVE your trio!! What a BEAUTIFUL center piece they will be!! Great job on the MIM challenge! Wow, these are amazing!! SO inspiring. Nicely done!! So cool, Tara! So, so cool! So pretty! 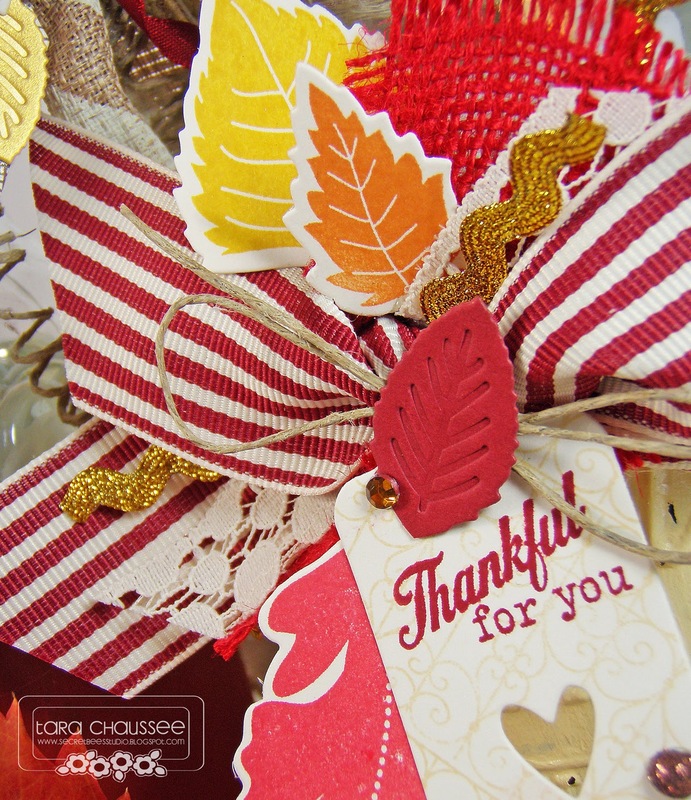 Love the fall theme and the gorgeous embellishments.